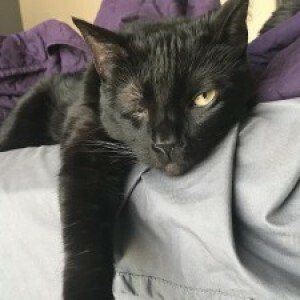 A funny thing happened after I posted the match-ups for the Round of 32 earlier this week: I became, quite possibly, the most hated person at Autostraddle. Even my own TV Team colleagues turned on me. First, Carmen said, “Wow Natalie!! I didn’t know our friendship was ending today, but here we are,” when she saw her faves — Denise and Kat Sandoval and Erica Hahn and Petra Solano — pitted against each other. Then Valerie chimed in calling the Waverly Earp vs. Rosa Diaz match-up the rudest things I’d ever done to her. I got messages from lots of Autostraddle readers telling me how painful the match-ups were and how much time they spent agonizing over the right choice. This is why they call it March Madness, right? 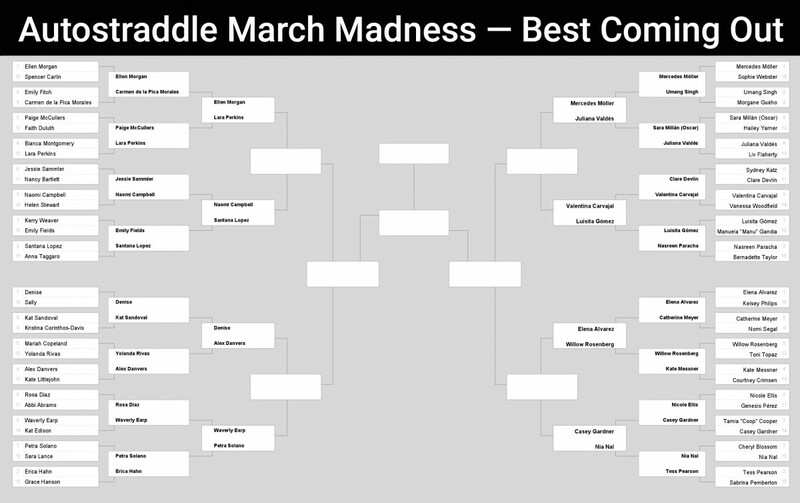 I’ll save you the basketball nerdery for why it’s called March Madness or when the regional semifinals got dubbed the “Sweet 16,” and instead, let’s hop right into reviewing the havoc you reeked in Round 2 of our March Madness competition…and seeing what match-ups cause me to lose friends this time. 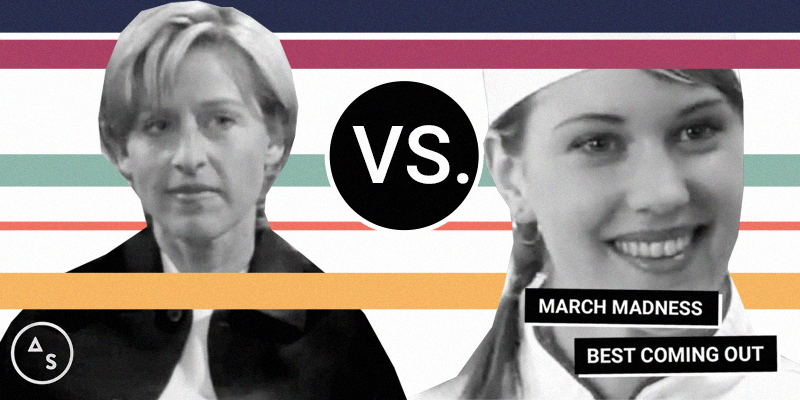 In the CLASSICS round, everyone’s favorite soup chef continues to pull out upsets, as Lara Perkins follows her upset of Bianca Montgomery with an upset of #5-seed Paige McCullers, in the closest match-up in the region. Paige wasn’t the only Pretty Little Liars alum to taste defeat, as GLEE‘s Santana Lopez defeated Emily Fields pretty handily. I suppose I shouldn’t be surprised that Ellen’s managed to advance through two rounds — she is the #1 seed, after all — but defeating Carmen de la Pica Morales? I definitely thought she might stumble. 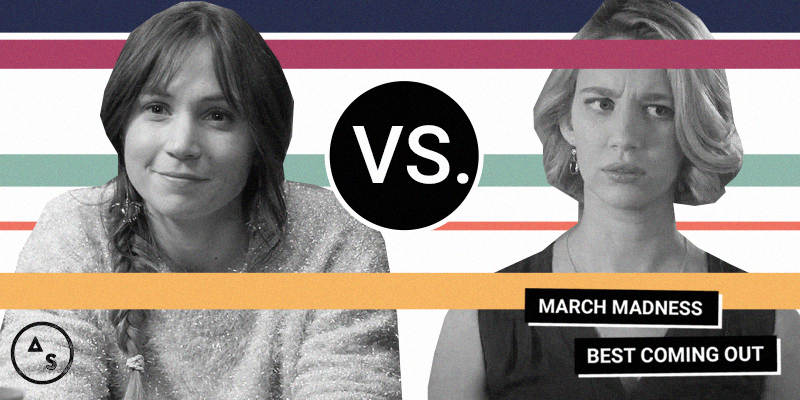 In the Baby Gays region, one-half of our reigning March Madness champion, Kate Messner, is taken out in the second round by Willow Rosenberg. It’s not a surprise, really — it may have been an impossible match-up — but still, I’m a little heartbroken to see one of my favorite baby gays bow out this early. Meanwhile, I may have underestimated the staying power of Casey Gardner from Atypical: first she upsets Coop from All American in the first round and then she upsets Nicole from Fresh Off the Boat in the second?! Clearly, I’ll have to pay more attention to Atypical when it returns later this year. 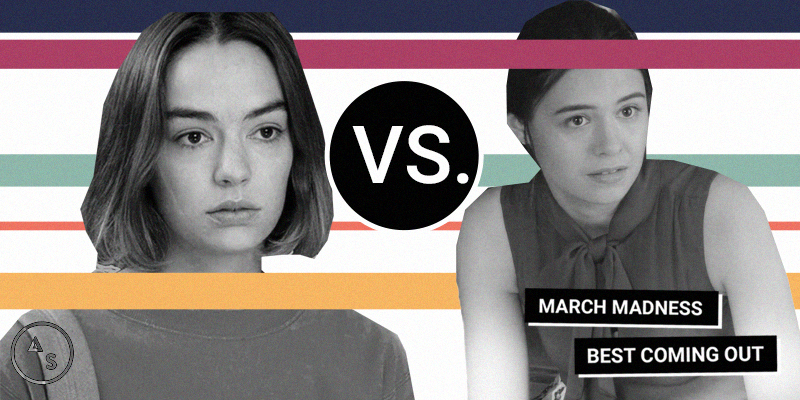 She faces a real test in the Sweet 16, though: Nia Nal of Supergirl has pulled two upsets of her own, winning both of her match-ups in overwhelming fashion. I try not to pick favorites when it comes to March Madness but I couldn’t help rooting for Erica Hahn in the GROWN region. I loved that character so much and even though it’s been ten years (!!) since she was on Grey’s Anatomy, watching the video of her coming out to Callie still gets me every time. But, hey, I get it…it’s hard to side with a character that’s been off the show for 10 years than a character that proudly proclaimed her bisexuality to her ex-husband a few weeks ago. 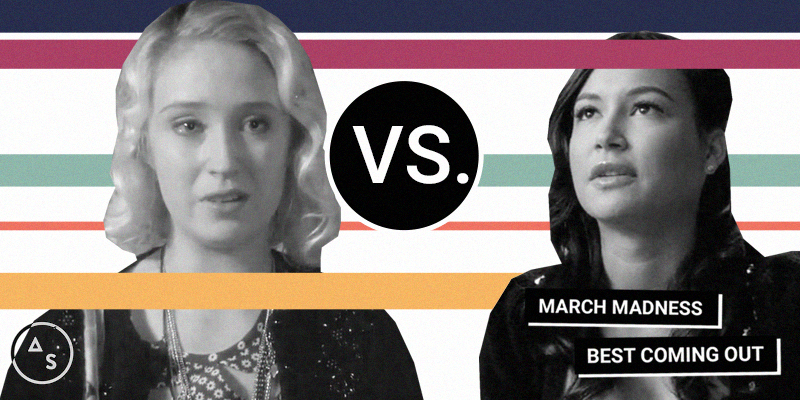 Petra’s win means that she advances to the Sweet 16 to face Waverly Earp, who was propelled into the round by the #FightForWynonna fandom, over a formidable Rosa Diaz. So, yeah, you have that right: Petra Solano vs. Waverly Earp. I think we just found the new rudest thing I’ve ever done to Valerie. 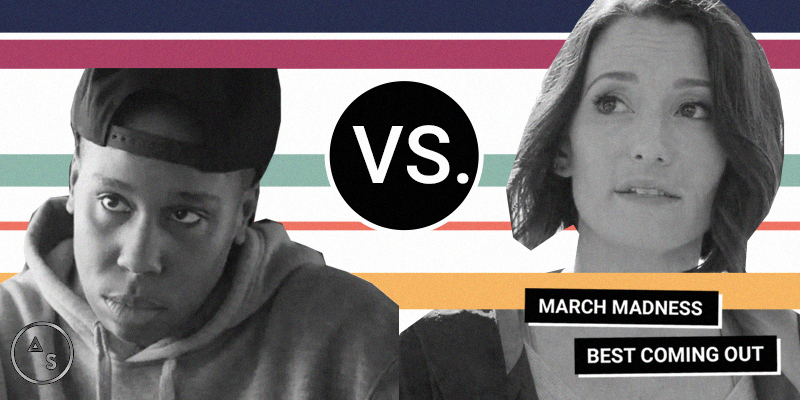 Alex Danvers has been the lead vote-getter in GROWN region but now she faces her biggest test of March Madness thus far: the Emmy award winning coming out story of Denise from Master of None. 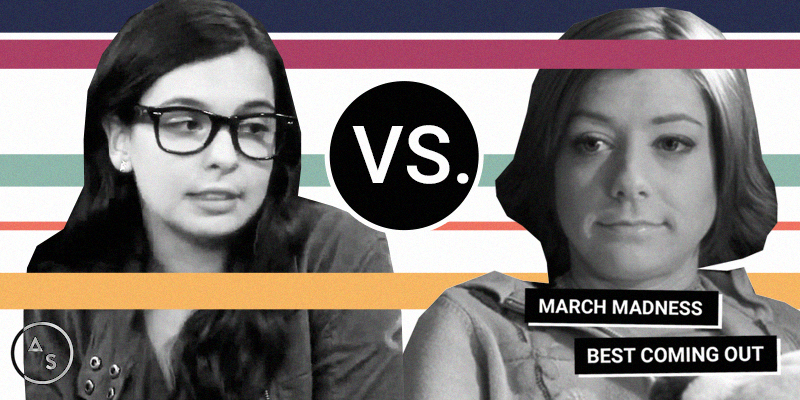 In the International region of last year’s March Madness competition, Kate and Rana of Coronation Street had a relatively easy path to the Final Four. I attributed their advantage to the fact that they were slightly more accessible (read: English) than some of the other shows in the field. But this year, the votes have gone a different way: the four contestants left standing in the International are all from Spanish speaking novelas. Despite a valiant late push from Derry Girls‘ star, Nicola Coughlan, our favorite wee lesbian couldn’t pull off the upset of Valentina Carvajal. 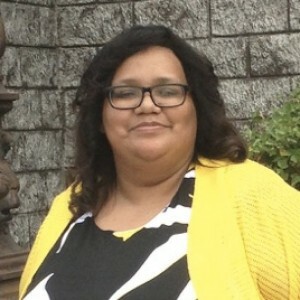 Her fellow Channel 4 lesbian, Nasreen Paracha also tasted defeat in the Round of 32, going down to Amar es para siempre‘s Luisita Gómez. 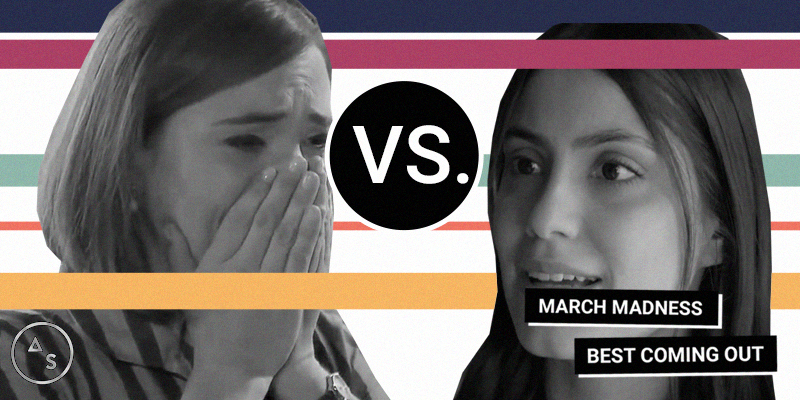 So now we’re left with three amazing ships, with three unrelenting fandoms behind them: #Barcedes vs. #Luimelia vs. #Juliantina. It’ll be fun to see how this shakes out. Remember, you have 48 hours to cast your ballot. If you’re not familiar with a character or show, check out my earlier write-ups — Classics, Baby Gays, GROWN and International — and the video links (where available) to help you make up your mind. We’ll be back on Tuesday with an updated bracket and the results of your voting. So who’s going to the Elite 8? 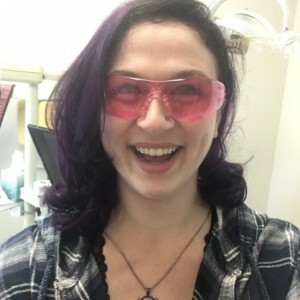 Hi Natalie. Picking between Elena Alvarez and Willow Rosenberg was one of the greatest trials of my life. In honor of trying to heavily influence this vote, let me remind you of Alex’s first gay panic. 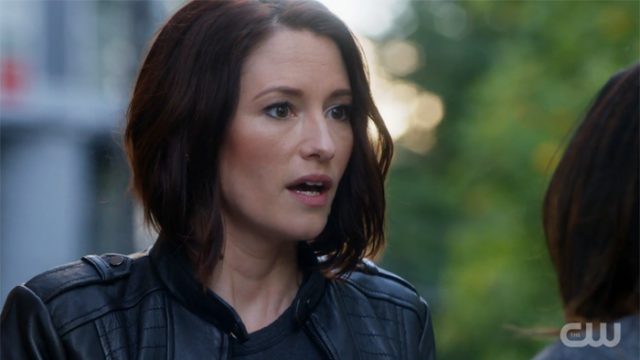 Vote Alex Danvers! elena vs. willow!?? waverly vs. petra?!? 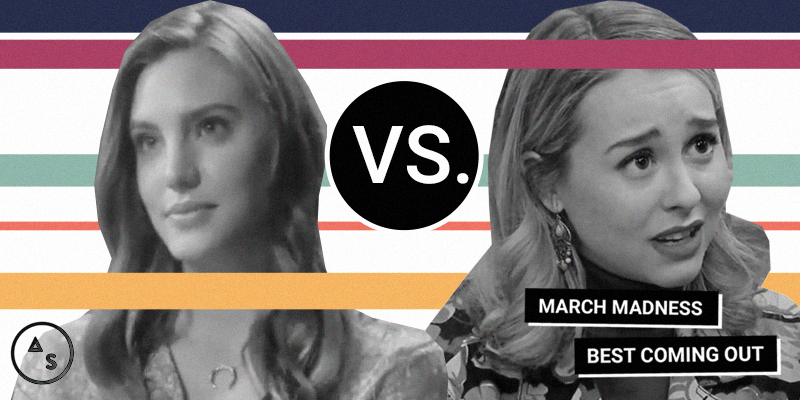 as if this round isn’t stressful enough there’s a chance juliana and valentina will be going up against each other next round…good lord how am i supposed to make these kinds of decisions?! And Waverly vs Petra almost broke me. Yo Petra, I’m really happy for you, Imma let you finish but Erica Hahn had the best coming out speech of all time. Of all time. Petra vs Waverly just cut my soul. So different, and both so great!!! Actually, what I really love about Petra’s story is that it highlights a paradigm that a lot of people are in denial about – that we don’t always know we’re potentially queer until later on in life. I also really like that her coming-out wasn’t made traumatic by anyone’s reactions to that abrupt change (I mean, Petra just generates her own drama – no need for gay panic). The late-bloomer thing is certainly something I hope to see more representation around. Alex Danvers was pretty good too. …and I managed not to finish this thought. So the whole GROWN category here is great! Thanks, team. Also I think Alex Danvers should be winning this whole thing, thank you for coming to my Ted Talk. I am honestly surprised Nia got so far, because I am trans myself and still didn’t really feel her coming out story one bit and I am not really sure why. I feel personally attacked by the international bracket final four. DENISE!!! 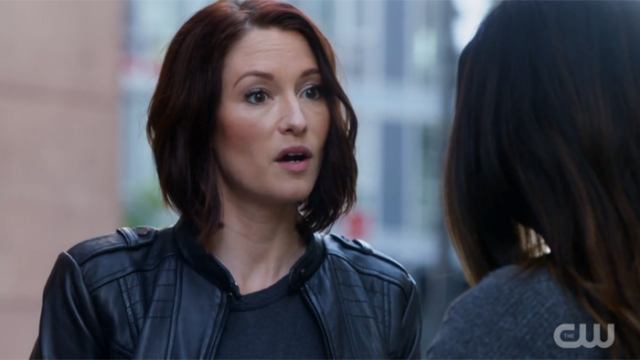 i loooove alex danvers (particularly her hair this season A+ should win its own emmy) but her coming out story was such a let down because it seemed so cliché. i’ve never seen anything like the thanksgiving episode on master of none. it was so well written and so clearly written by a queer woman. even though it wasn’t at all like my experience it felt so relatable. denise wins this round for me hands down (sorry alex)! Because they can’t all be in the same category and must be spread out into the 4 groups? Does it really matter..
I’m guessing classic has little to do with age (because otherwise everyone could count as either grown or baby gay) and more that there was something especially significant about their story? Something or someone usually “wreaks” havoc, not “reeks” it, but I guess anything is possible.